The death of Bill Bailey early in 2011 came as a severe blow to KOPV. Bill was one of our founder members, cure and had remained actively involved in many aspects of our work. But Bill’s contribution to Older People’s Services is now to be permanently recognised in a new housing scheme being developed in Kirkby. 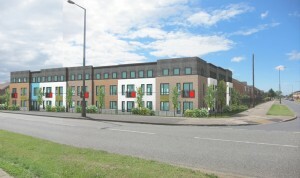 The Extra Care Housing will provide 34 units at Holly Vale in Kirkby, and is being developed in partnership between KMBC, Knowsley NHS, and Cosmopolitan Housing. Extra Care Housing is the term given to accommodation in which varying amounts of care and support can be offered, with additional shared facilities and activities available that enable residents to live independently whilst making life easier and more enjoyable for them. Many of the features incorporated in the design have been included following consultations with KOPV members. KOPV members were also invited to suggest names for the scheme, with Bailey Court being the most popular choice.